﻿ Smittys Pizza - Ohio. Find It Here. Open since 1978, Smitty's has made themselves a staple of the Marietta food scene. 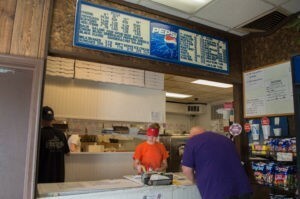 Located on Front Street, but out of the hustle and bustle of downtown, Smitty's has that old fashioned pizza place feel. They offer pizza, subs, salads, wings, homemade pie, ice cookies, Ben & Jerrys pints, Graeters pints. They also offer eat in, take out, or delivery. Be sure to stop by or order out for a good ol' taste of Marietta history!